“Witty and insightful . . . Beginning with the manic episode that led to her diagnosis, Forney chronicles her journey toward reconciling the dual natures of bipolar disorder: a dangerous disease, but also a source of inspiration for many artists. The long journey of medication and therapy is kept from gloom by Forney’s lively, likable cartooning. . . Readers struggling with their own mania or depression will find Forney good company, and others searching for insight into the minds of troubled artists will find Forney an engaging storyteller.” Full review here. 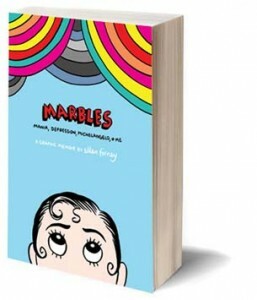 “For anyone who loves graphic memoir or has concerns about bipolar swings, creativity and medication, this narrative will prove as engaging and informative as it is inspirational. . . Not only does [Forney’s] conversational intimacy draw readers in, but her drawings perfectly capture the exhilarating frenzy of mania and the dark void of depression.” Full review here. Keep an eye out for my events in November! And, exciting: the launch will be Sat., Nov. 10 at 7pm in the Microsoft Auditorium (yay!) at the Central Library downtown.